After the last vote and the last minute cross-out vote, the Brains begin to accept their fate on the new Gondol is dire. Good thing it's time for the MERGE! Chan Loh gets five minutes to pack up (and hide the Immunity Idol bulge in their undies) and head over to their new home. Everyone is ecstatic to make the merge, indulging in a feast with all the fixins. It's also the perfect time to let inhibitions down briefly, which is of course Debbie literally purring about how hot Nick is and Jason shouting enthusiastically about a lot of things. The merge tribe is Dara and with their new flag painted and hung, it's time for the game to begin. The Brains are back to four strong, with Debbie using lots of zany pairings to assure their tightness (Ebony and ivory? Toilet and toilet paper? OK, sure). Nick wisely assesses that the Brains and Brawns aren't going to want to work together and becomes a hot commodity between the sides. After being courted by the Brains, Scot and Jason really let Nick into the mix. Like REALLY into the mix by revealing Tai has an idol. Arrogance is a key part of this merge, but only by Jason/Scot but Debbie too. In a Godfather-esque manner, Debbie tells Tai he's a part of their alliance eventhough dude is clearly not interested. C'mon Debbie, buy a guy dinner before you try to seduce him. Debbie isn't picking up the social cues that she's driving everyone bonkers and is becoming a liability. No one wants to create an alliance with the most annoying person on the beach, which is detrimental to the Brains' survival. Neal reveals to Aubry he has the Hidden Immunity Idol and to avoid their Debbie crisis, maybe that idol could help save them. Before kicking off the first individual Immunity Challenge of the season, Probst has everyone show off their battle wounds. After a quick gross rehash, the castaways set their eyes on the three-headed individual immunity necklace they all shall covet for the foreseeable future. The challenge is to stand on a log while balancing balls on a wooden disc. 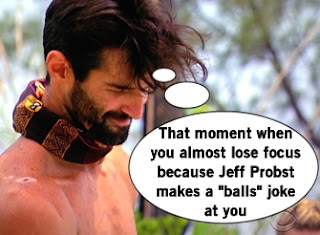 It's the ideal challenge for Probst to make comments like "balls dancing all over the place"to make someone smirk enough that you worry they'll lose focus. Getting up to three balls on the disc, Nick wins the first individual Immunity of the season. Truly the belle of the ball, or episode, this week. Despite the Brains efforts to court Nick and Michele to their Brawn boot effort, they ultimately decide to align with the Brawns who'd be easier to beat in the end. Uhh, you've got a long way until the end, friends. The vote will be directed towards Aubry, as it's less expected and best case scenario is Neal flushes his idol in the process. 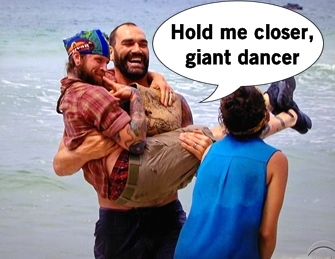 But all plans are thrown off when Probst arrives to the Dara beach with medical by his side. It's like the scene in A League of Their Own where a war telegram arrives before the big game and someone is going to be told their husband died. In this scenario, Dr. Rupert is checking out the nasty wounds of Tai, Scot, Aubry, and Neal to determine their fate in the game. Cue vomit-inducing close-ups of pus-filled wounds. Tai and Scot are given a clean bill of health. Aubry is given anti-biotics for her inner-thigh lump. But it's Neal who gets the worst news of all: he's being pull from the game. "Mount St. Neal" on his knee has erupted into a major infection near the joint, not to mention a heinous infection developing on his back. A teary Neal has to accept his fate and says his goodbyes... but keeps his prized Immunity Idol in his possession. The episode ends with an Oregon Trail declaration of Aubry having to "pave a new way" which hopefully is a sign of an exciting game to come.